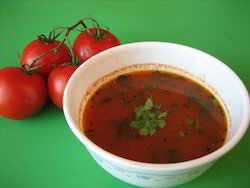 - We Present You High Quality South Indian Soup i.e Kwick Rasam Mix the Traditional Appitizer. with Rich Aroma for Institutional Customers. South India has hot, humid climate and all its states are coastal. Rainfall is abundant & so the cuisine style varies! Coconut is the main ingredient of south Indian recipes, also having collection of some mouth watering south Indian food and dishes.